We have always been told that content is king, and even on the darkest of SEO forums the whispers are that Effective SEO is moving in this direction. But is it? But here’s the thing. There is content for your own site and the content that might surround your links on another’s site. Your link juice. Do either of these really matter? Is this all just smoke and mirrors. A “scare” tactic by Google if you like to make those in internet marketing afraid to spam links and poor content? Of course there has to be some high profile examples of poor content and spamming failing. Black hat tactics been the ruin of some websites. This has to happen for the fear to spread. But is this spread real or just some very specific tactical take downs, possibly 100% manual to give the impression of an effective algorithm when in fact Google,s crawlers and the computation machine it “calls home” to is just so much nonsense. The wizard behind the curtain is just one old man pulling the odd ineffective lever and shouting through a megaphone for effect? Does this content matter? At all? Some days I’m sure it must count, other days I’m sure it’s nonsense and that Google really hasn’t got a clue about content what-so-ever. Here is an example. There are quite a few sites selling SEO and link building tools. Lovely. If used correctly they are a boon to White hat linking techniques, although experience tells me that most are bought by those people looking to leverage a less than pearly shaded colour of SEO. Anyway I digress. Here the web owner has provided more supporting content, advice and tutorials than I have ever seen for any SEO product ever. The site is now – in all but Google’s opinion apparently – an absolute authority. I counted getting on for 300 articles on SEO in general and Ultimate Demon in particular. None of this is scraped and a random test on Copyscape shows it as 100% original (not 80%+..but a genuine 100%) it reads well, is great advice and has been updated almost daily since the product was released. It is a labour of love from the author Paul Rone-Clarke. It offers a good long lasting bonus and the same discount as everyone else. 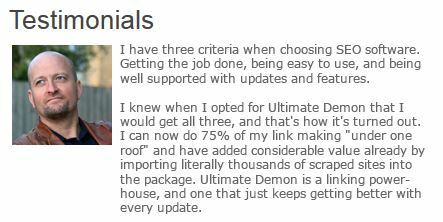 The bonus is likely better than most – a private members forum where resources to help users of Ultimate Demon are added monthly. If you are a serious user this look like the best deal. But – you know what? It doesn’t rank for any of the buying phrases for Ultimate Demon. Not even close. Now that’s fine. Hands up – no site has a right to rank. You earn it. Apparently you earn it with good content, social signals and some measure of link building to reinforce the issue. So let’s take a look at those sites that outrank it. Yup – “micro sites”. One page (or 2 page) wonders. The content on one of them is a direct copy of the software developers “features” list and 25 other words. It is 90% plagirised. Completely and utterly “copy and pasted” from the developers site. Seriously? This image is taken from one of the microsite’s and is actually a quote stolen from the developers site of the authority affiliate. Im other words he’s being outranked by his own content, even though it’s (by then) third hand and copied. What sort of sense is that supposed to make? How does that tie in with Panda for instance? His own words. plagirised, used by a two page micro site to out-rank his own authority site? How the hell does that happen. A cursory look at the linking profile of both the sites that outrank demondemon.com shows how they win – and win comfortably. Paid links. These sites contain nothing but these snippets. The main URL is (in most cases) a category page, and inside each category there are 2 or 3 pages with 8-10 links and snippets like this per page. A quick look at WHOIS for a sample of 12 of these sites shows every one of these sites was auctioned to one of 4 buyers between April 2012 and February 2013. Interestingly all the buyers (I suspect there is only really one – and 2 “pen names”) live within the same U.S state.. within 3 miles of each other according to Google maps. Now, I can find out this information in 10 minutes. But Google has allowed these private link farms to exist for month after month and done nothing. But that’s not the real take away from this. The real take away is “links win” The sites that are ranking have no social signals, no original content and are never updated (Panda where-art thou?) The links they have are on sites that have no connection to the subject matter (other than being bought and “categories” for snippets added very recently..is that all it takes?). The content that surrounds the links is 100% copied and most cases just the same 80-100 words repeated over and over again. Many of the links actually have no content what-so-ever and just sit on a blank page. So while White hatters call for all these things like user engagement, regular updates, context, relevance. This sort of proves that none of that matter one iota. At least as far as the Ultimate Demon affiliate niche goes. If you are an affiliate, I’d love to know, what is your experience in the niches you are working in? Just buy some private links, steal your competitors content and slap up any old site in 10 minutes and your a winner. Sod content, who cares about social signals and proof, what matters is links and links only. The rest is guff, and those that say otherwise are not in full awareness of the facts or just engaging in “wishful thinking” about the way they wish SERPs worked rather than the way it clearly does. Those who wish to have a really sophisticated website will need to use sophisticated programming techniques to design their website, and they may be able to find the items they need to make the website popular and state of the art. The more you know about web design typically the better your website will be and the more it will appeal to others. Then let’s see if Sitebildz can really make a difference in terms of hosting, domain name registration and website set up. Is it hard to build a website? is something that is relative. It depends on how much customization you want. A Sitebildz site – while not allowing massive amounts of user customization – is very effective SEO wise and takes a matter of minutes to set up once you have sourced the content. Whether a website is hard to build or not is something that individuals need to determine for themselves, Basic websites can even be built by children. Some of the websites that are created need very little training only technique in order to make them user friendly and accomplish their purpose and sell, or state the mission of the business or service. Bear is mind a basic website with just a schedule is much different from a state of the art website with schedules and live chat and sophisticated technical know how. One can build a website simply using Godaddy or some sort of web design or can use PHP and other advanced programming language to create a state of the art website with lots of bells and whistles. At a minimum website creators will have to learn about adobe, adobe flash player an thing of this sort in order to build a site.A website more advanced websites need have a number of elements in place. A basic ecommerce site can be purchased for about forty dollar a month and you can get design help that is simply trial and error an can keep it for a ten day trial. Is this worth the time and effort? These days there are online tools that allow busy business owners to build a website to some pretty exacting specifications in a matter of minutes. Sitebildz is just such an application. Use a basic website creation kit to try out easy web creation. You will not need a very sophisticated site with a basic ecommerce site and can easily create an online store. At a minimum as mentioned, you will need to learn to work with adobe flash player and a few of basic options to make your website appealing Take advantage of all of the options such as a free trial on a creative site or signing up for a web design course before paying design professionals to invent your website. Here is where Sitebildz has some small failings at the moment. The ecommerce side does need developing for sure, however affiliate deals with the main 3 intermediaries are in place, so the opportunity to begin earning with a Sitebildz site is there from day one. Many would, however, like to see a true shopping cart implemented sooner rather than later. Decide on the type of site you need and want and whether you need to have a design professional make the site for you or if it is something you can do yourself. Designing a website may not be difficult with enough time put into it. I should come clean. I need to get something clear from the outset. I am not a fan of third party content spinning or scraping. The idea of taking another author’s work and using it to promote your own website or product does not appeal to me. I don’t say this as a moralistic judgement, and perhaps is a little bit of arrogance on my part. Most of the time I simply think I could do a better job or writing better content that would be more suited to promote the URL’s, products or sites. Ok. So, Google may well have a duplicate content filter. I don’t really care one way or the other, as I do not like I’m going to use duplicate content anyway. It lowers the value of the product I’m looking to sell and most of the time it does not reflect my real and actual thoughts on whatever issues I am expanding. If this blog survives any length of time and you, dear reader, to return to it often, then it will become apparent relatively quickly that I certainly have no problem with expressing the most verbose ideas. If anything my issue is to tighten my dictionary down a little and to use words a little more scarcely. Sometimes a new tool in the field of search engine optimisation needs to be looked at with a slightly different view. Perhaps even subverting the idea that the developers have for me at all in the first place. Well, lets take the example of most back-link creation tools sold purely as spamming utilities. Even though, with a little thought and a little pre-preparation they could be useful perfectly ethical purposes. They truly could become a White Hat time saving resource for you – and yet still be a fully automated part of your marketing strategy. Why shouldn’t they? Automation does not automatically equal “bad”. But what of a tool which sets out to scrape content from blogs, RSS feeds and article sites and then automatically spins this scraped content to achieve some level of uniqueness at the expense of often turning it into unreadable garbage. The obvious thought in the developers mind and one which is probably mirrored in the mind of most to combine these tools is the opportunities to post all this when content containing self-serving links. Plagiarise, Spin, Utilize. Although I tend to stick to creating sites on topics and within niches that I am already versed and know at least a little about, I’m well aware that many in Internet marketing and affiliate selling using micro-site technique which involves creating many sites on which they are not an authority. Let’s be honest. In most cases it is likely that many of the sites created by affiliate marketers in this way contain subject matter they know little or absolutely nothing about. So how do they create the content for them? There are tools that can be bought or subscriptions paid that will allow Internet marketers who are interested in “content curation” to simply research into a topic they know little about to get a foothold. Perhaps just to give them an idea to write their own article, or perhaps even an editorial on some of its existing work. An opinion if you will. Well, a content scraping and spinning tool such as Kontent Machine could do this equally as well. Just because it has the ability to turn a high-quality and informative written work into garbage doesn’t mean you have to use it does it? Imagine you are interested in simply learning about a topic and getting some inspiration to write your own articles. Learning which turns of phrases are used by those who understand it properly, learning about the competition and any possible controversies that may exist. Then turning this information to your advantage and creating your own 100% unique article. You can even provide a back link in the form of a co-citation and therefore SEO friendly manner to the original source of content machine scraped for you. You can get more white than that. It’s 100% clean and ethical. And yet it uses a scraping tool. But here’s the thing. It’s a scraping tool which he digs deeper than many desktop content curation software utilities and yet costs a great deal less to initially set up. This may be a recurring theme on this blog. Just because you have a tool capable of creating a great deal of spam or plagiarising other people’s work, it does not mean you cannot utilise it in a way which is both ethical and effective both in terms of the SEO results used and your return on capital investment for buying the product in the first place. Kontent Machine is a tool with just such possibilities. I’m not a big fan of arbitrary divisions, the idea that people in a particular profession are divided neatly and equally on either side of a fence is a philosophy I’ve grown out of. To my mind it’s an attitude that belongs in the playground. When I say I’ve “grown out” of it, I mean this quite literally. When I was younger I’m pretty sure I saw things more in terms of “black and white”, “right and wrong”. But this has certainly changed over the years. A greater understanding of any issue normally shows the full spectrum of opinions and attitudes lies between one mind set and another. 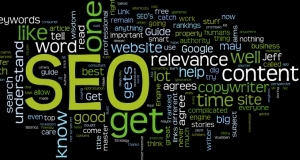 This site is particularly interested in the most effective way of promoting your website using both on-site and off-site SEO regardless of whether that is then categorised as a “Black Hat” or “White Hat” technique. A measurement of long term effectiveness rather than a judgement call. Before you jump up and down and accuse me of being a spammer, there’s something I should make clear; Unlike King Canute I do not believe that I will be able to stop the tide of changes that Google and the other search engines are implementing to prevent websites from advancing through non-ethical search engine optimisation methods. While I fully understand that short-term gains can indeed be made, particularly with long-tail key phrases using what might be described as less than ethical techniques, I am also a firm believer that web site owners who operate under these principles are doing so under the gun site of the search engines “ban hammer”. Search engine optimisation professionals with several years experience who deny this obvious fact, who persist in thinking that long-term results can be achieved using “quick fix” methods are fooling themselves or selling “snake oil” to their clients. Those new to Internet marketing and website optimisation might be forgiven for thinking that an abuse of the linking system will indeed give them the results they require and the Nirvana of a long-term autopilot income. It probably won’t. But against this lets not kid ourselves. The lone trader looking to promote his or her website will not be able to perform all the tasks necessary to run a successful business and the 40+ hours a week required to also make a website successful. Google’s “Coloured School Satchel” advert is very much the exception rather than the rule. Most good business ideas and the websites that support them are buried under a torrent of rubbish in Google’s directory system. Business owners who wish their website to have success in all but the most micro niche markets will need to exercise some level of self-promotion otherwise there is a greater than 99% chance that their online efforts will fail. Self Promotion. Good Or Bad SEO? Self-promotion; it’s just another word for marketing. It’s something that every business does. Ever since the first caveman invented the first wheel and asked his neighbour whether he would like one too, bartering and marketing have gone hand in hand. There is no society or civilisation on Earth and no business model that attempts to make a profit that does not have marketing. Marketing = Self-promotion. Marketing is absolutely essential to business success. Don’t kid yourself that it’s not. While we hear that Google discourages self-promotion they might as well be King Canute themselves. It’s a ridiculous statement and a baffling principle for the search engine giant to promote to their fellow business partners. Businesses self promote, they always have, they always will. But there are ways to do it, ways that will not involve the production and broadcasting of spam, and, more importantly could involve careful syndication of well-written content to a relevant audience who would benefit either from your products or from your knowledge. This ethical manner of promoting your website certainly does not preclude the use of automation nor does it disallow the outsourcing to SEO services. In other words the use of link applications like Ultimate Demon or the hiring of professional experts in the field. The aim of this website is to tread that thin line and to work out a long-term spam free effective SEO technique from the thousands of tools and services being offered. I will also make it my aim to extrapolate those that offer the best value both yourself, your website and for the Internet at large. If I say now that I have discovered some moderately effective but extremely expensive methods that could be classed as White Hat and some relatively spam free but incredibly successful methods that the miss informed could construe as Black Hat… as well as every shade of cost to performance ratio and spam production potential in between. Many of the products are review or services I examine will not lead me to an exact conclusion of “Yes you should use it” or “No you shouldn’t”. The likelihood is that the context that they are used in will be the most important factor and, if your main aim is ethical optimisation or a short quick fix to an immediate problem. It will more often than not be a case of “horses for courses”. Having read through this two or three times it’s only just sinking in what a task on creating for myself. Link building tools authoring services local marketing expertise multimedia penetration and peer-to-peer relationship building as well as every other aspect of online business is open for discussion. But I’ll take them all one at a time. Thanks for reading so far..